I have been chopping my leaves with gator blades on my lawn mover. This year the oak leaves got a bit heavy and I borrowed my neighbor's 6 hp little wonder blower. It did pretty well but tons of leaves get pushed into bushes at the edge of the yard. 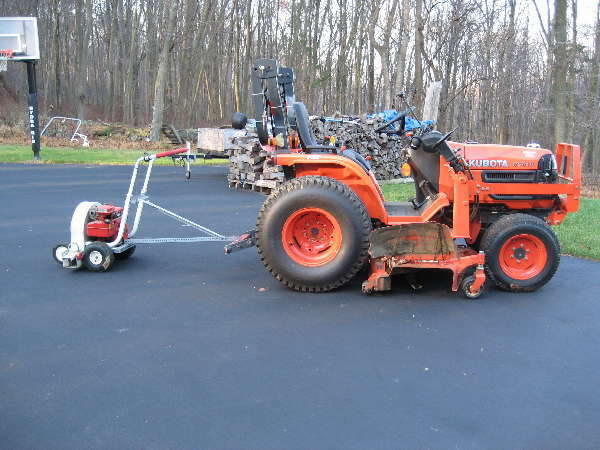 I toy with the idea of purchasing a pull behind cart with vacuum for the mower but $1100 and another engine to care for and store makes me rethink that option. I get frustrated when I think that I have a CUT that I cannot use to help me with this problem. A blower for the CUT would run thousands. Has anyone come up with any innovative low cost way to get rid of leaves? Any cheap diy options for the CUT? Several years ago my Dad stopped doing his own yard so he gave me his push Little Wonder leaf blower. I rigged up a makeshift tow bar for it out of heavy duty garage supports and it works great. I am fortunate in that I can drive the tractor around the house in circles, chopping and blowing at the same time. I use the back pack blower on the beds first and knock off 2.5 acres in about an hour. In your case, you might be able to chop the leaves and then blow the chopped material into your beds. Admittedly, I am fortunate in that I can just blow everything into the woods that borders the perimeter of my yard. There's something to be said for waiting till spring. More leaves will fall by then, they'll insulate the turf over the winter, and they'll be more crispy and crumbly (when dry) after a winter on the ground. Since that would make it a once-a-year operation, the most cost-efficient solution would be to hire kids (maybe a school fund-raiser, maybe with some neighbors) to do it by hand. Of course, you'll have to buy some hand rakes. 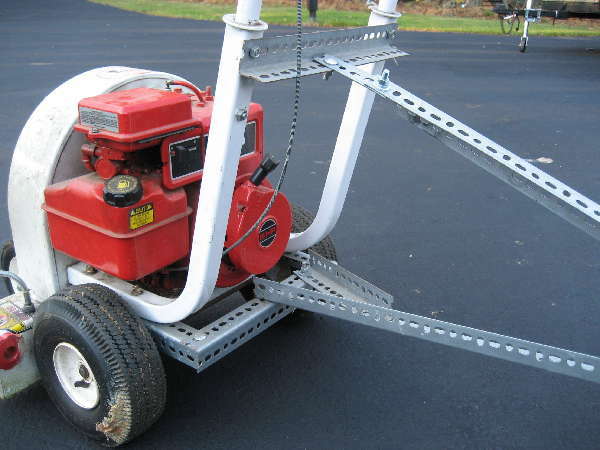 Or look up the Cyclone attachment that converts a mower deck to a vacuum and collector. My father was telling me that new studies show that shredded leaf mulch is good for your lawn. I guess as long as it is not spread thick! Crunch and I share the same solution, I too have a set of gator blades that don't seem to be good for anything but grinding up walnuts and leaves. Our lawn in town is pretty small with just one tree that drops lots of leaves and three or four walnut trees too, it's kind of fun to smack the walnuts to see how far I can make them fly. Dennis, whops, where is your mower deck guard? I think I see it folded up on the deck, mine is upstairs in the shed somewhere. 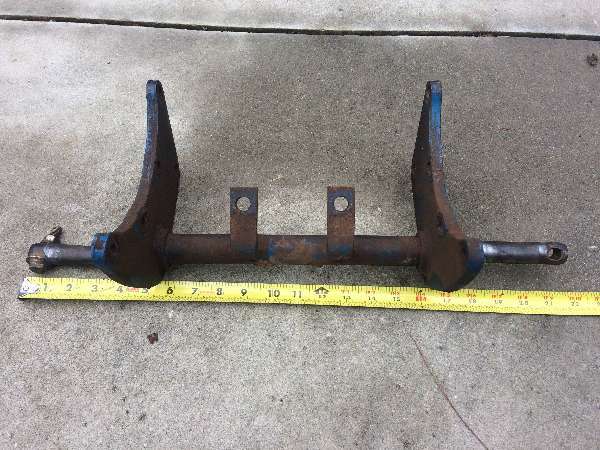 whoops!, where is your mower deck guard? I think I see it folded up on the deck, mine is upstairs in the shed somewhere. Yup, I tie it up every spring when I put the deck back on. All the landscapers remove them as well. If you leave it down it windrows the cuttings, I wish the angle of the deflector was more adjustable so that some protection could be offered versus Zero! This year I went between the hand blower and Ferris with a triple bag. It wasn't bad other then trying to get the leaves out from the shrubs and out of the corners. For that I like the trailered power units so you can just use the hose to vacuum off the remote areas. To leave them though the winter, while that is some tough spring raking once the snow has been on them! We did pick ours up with lawn mower and bagger and lawned looked good. Snow is very seldom here, so we have plenty of snow birds instead, but that is another thread. While we still have lawn mower with high vac and catcher I just take my ZTR and sort of like Dennis run in circles around our house throwing the clippings away from the house. By the time the mower has run over leaves twice they really are small and make litle impact as to appearance. At times will cut our front yard only discharging into every tighting circle and it works very well with a few passes at the end to spread the clipped leaves out. Thanks for the ideas everyone! Dennis, I was thinking of the same idea only with a towbar for my lawnmower. Unfortunately the little wonder belongs to my neighbor and I hesitate to mess with his machine. And he wants me to use it to pay me back for assist I give him at times. I don't mind crushed leaves in my lawn but I think it makes the soil acidic so probably a little lime where you chop the leaves is in order for the grass in the spring. I saw one person who used his york rake to scrape the leaves off the lawn. But I imagine you have to be very careful not to tear up your lawn. You are right about the soil with the leaves. I normally drop mine on the field behind my house and you can see the difference in the crops! We are going to do some fertilizer tests this spring before they go to till again to check it as it is noticable although in the long run these fields have never had anything to add much in decaying matter to help build the soil. I hope they don't ask me to buy the lime!!!! They are old potato fields so the ph is low anyway.